My goal is to keep this thread short so that someone looking for information doesn't have too much to sort through. It's mostly intended as a starter guide. 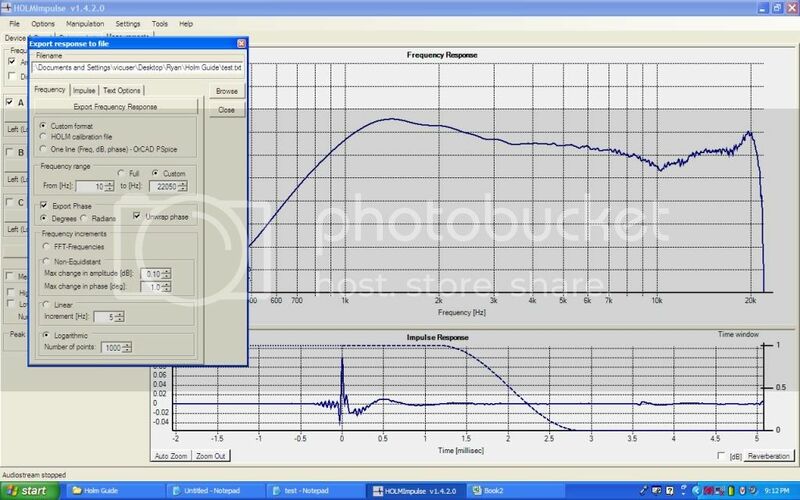 HOLM is a free measurement software program. 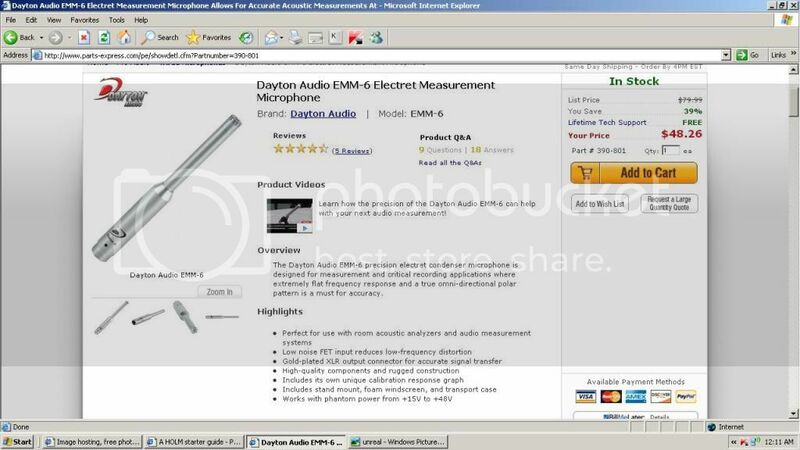 You still need a mic, mic preamp, and a PC with a soundcard to make measurements. Ryanbouma covers making an FRD file in post #7. Last edited by rpb; 02-13-2012, 08:34 PM. This is the device and signal page. Most of the settings are done by HOLM by default. Several settings may need to be changed. I'm no expert on these settings. I'll try to link to more information at a later date. 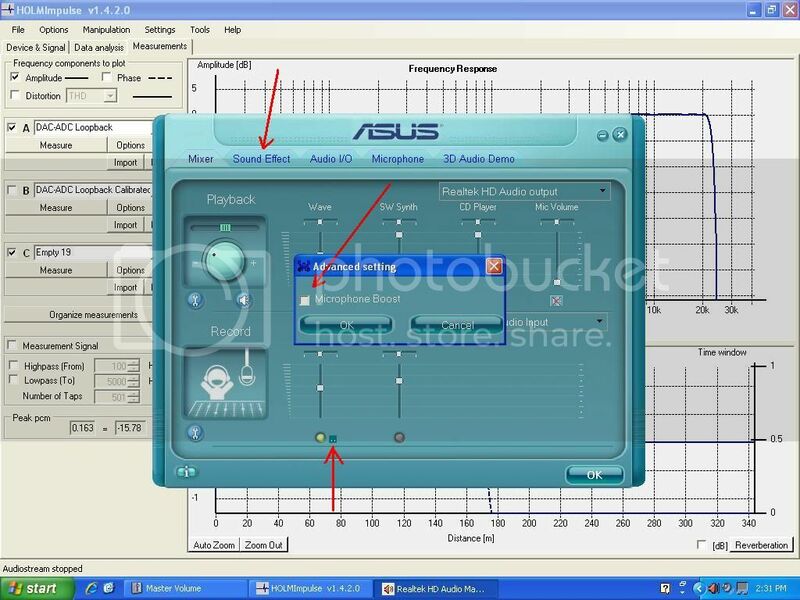 If your computer has more than one soundcard, make sure that the one you want to use is showing here. There are also selections for left and right that may need to be changed. 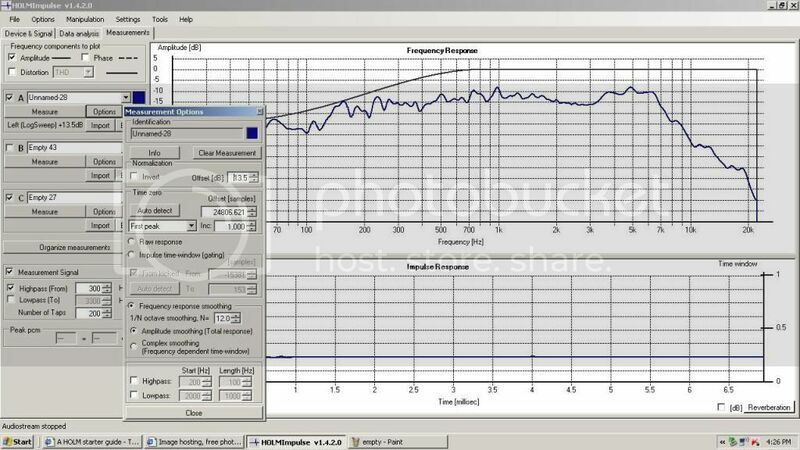 I don't recall what the default PCM amplitude setting is. I suggest setting it at about -10 dB initially. This is only for the purpose of reducing the SPL of the first few sweeps, and loopback test, and can be changed at any time. As you can see, it is set at -3 dB in this example. 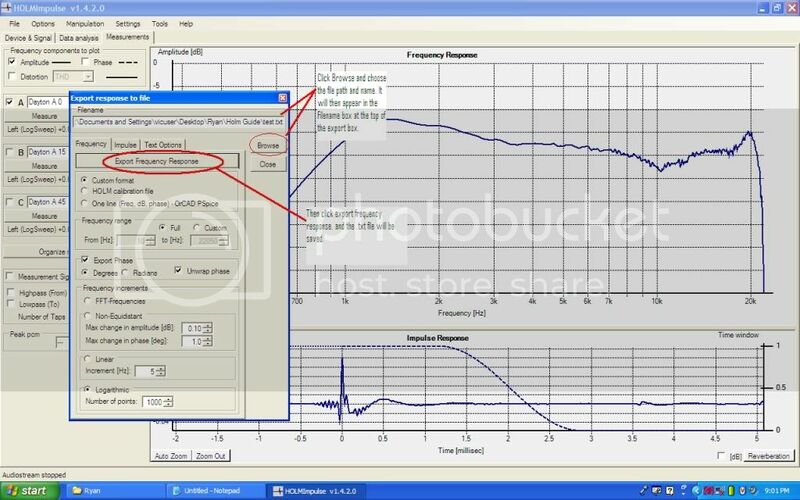 The SPL of the sweep can be adjusted using the gain control of your amp as well. I like the precision of the adjustment in HOLM. 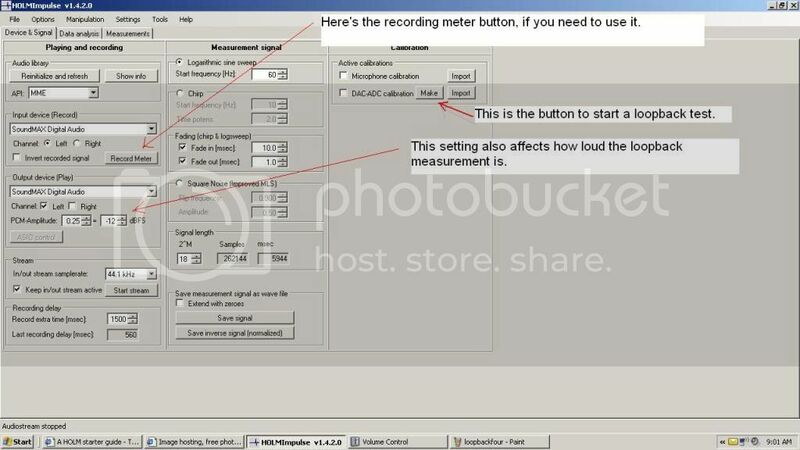 If you want the SPL 4 dB louder, adjust the setting by 4 dB. 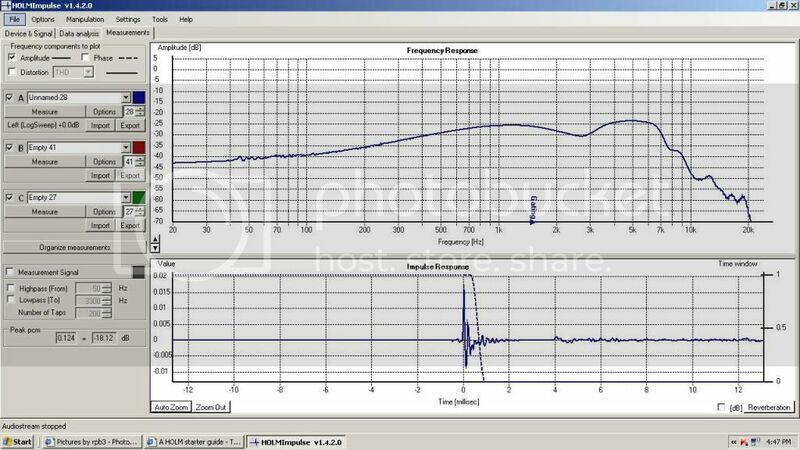 Make your first sweeps at low SPL until you find the appropriate settings for your amp, and HOLM. If your amp has bass and treble controls, set them to flat. The Options menu is next to file. One thing to change in the options menu, is the impulse dispay. Change it to "Impulse as time"
Last edited by rpb; 02-18-2012, 05:19 PM. 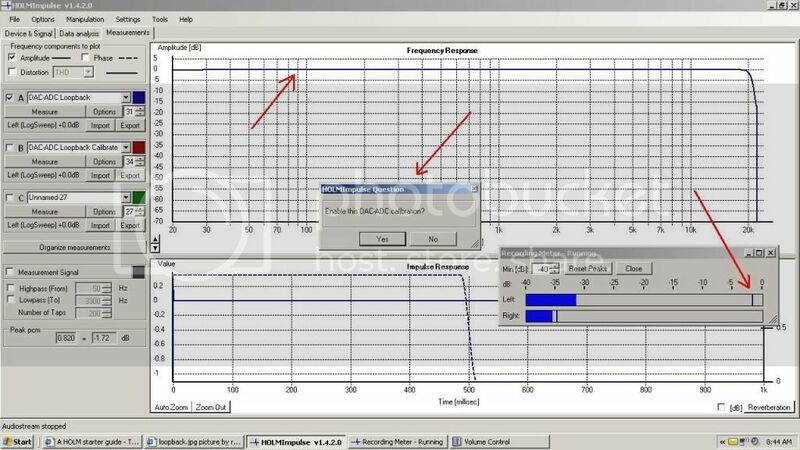 The loopback measurement is used to adjust your sondcards response. If it has a peak, dip, or rolloff at some frequency, the loopback corrects for it. It's easy to do. HOLM tells you what to do when you start. Basically, you connect the output of the soundcard to the input, and run a sweep. The loopback is started by clicking the DAC-ADC button "make" on the top right of the device & signal page in the Calibration section. The HOLM page switches, and displays a button to start the process. The loopback signal was too loud and was clipping the soundcard. I opened up the volume control for a look, and made some changes. I reduced the wave setting a couple notches after seeing that it was maxed out here. In many situations, a mic boost function is selected by default, and needs to be turned off. Sometimes there is only a tiny button that may, or may not be marked. Touching it with the mouse may reveal what it is. I setup my notebook today for use with HOLM. Here's where the mic boost was hidden. Be sure to disable any special effects too. 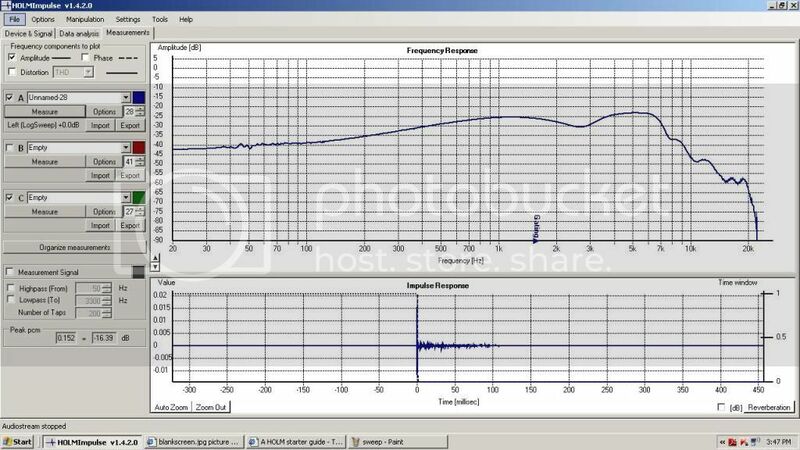 Now the measurement peaked below 0 dB, and worked fine. The soundcard really didn't need any adjustment to speak of. Click "Yes" to use the calibration. Last edited by rpb; 02-15-2012, 07:07 AM. If you have setup your soundcard, and are ready to measure, Here is the main screen that you will be looking at when you start. Before using HOLM for the first time, I suggest turning the volume very very low. Turn the volume up after you see how loud it is. The measurement is started by clicking on one of the three buttons that say "Measure". As the measurement starts, you will see this warning. The sweep can be pretty loud, so wear ear protection. The sweep starts at low frequency, and increases. If it's loud initially, it will continue to get louder at higher frequency. 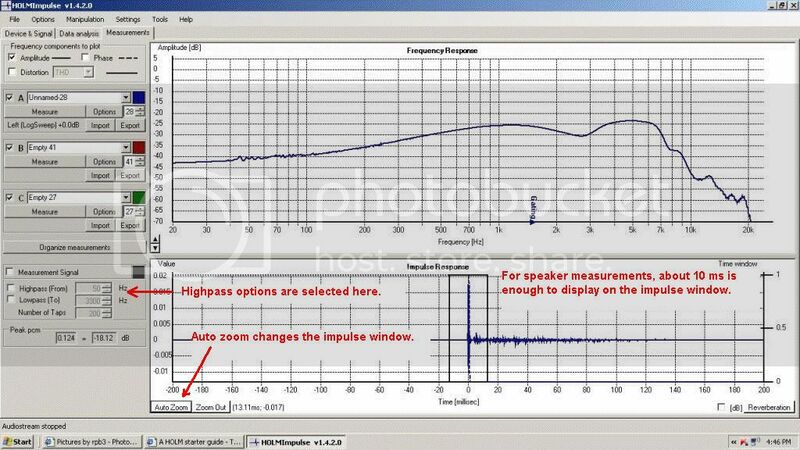 For a vented speaker, it might be a good idea to highpass to reduce the possibility of over excursion. Here's what shows up after the sweep. The gating still needs to be set, so what you see will change. Holm sets a gate, but it usually needs to be changed. 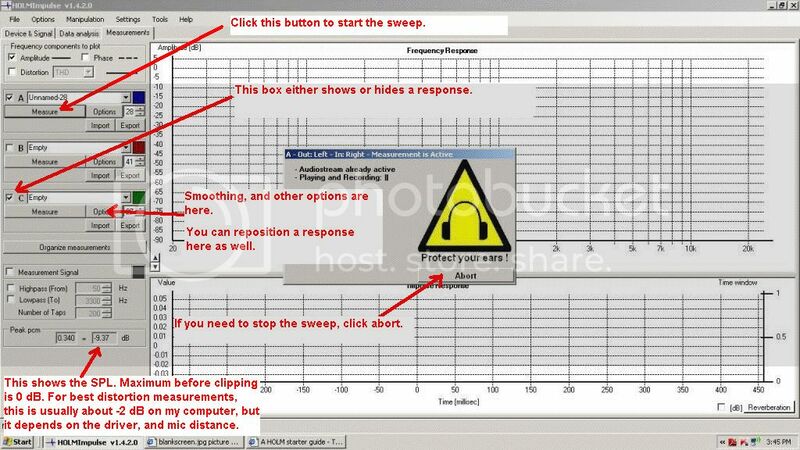 You will need to set the gating after each sweep. To set the gating, you need to be able to see the impulse response better. I selected a small section with the mouse as seen below. When you release the mouse button, the selected area is expanded. You can also click on auto zoom. If you want something a little different than auto zoom shows, then do it manually. Last edited by rpb; 02-13-2012, 08:45 PM. To set the gating, grab the dashed line in the impulse window using the left mouse button, and move it. You can see a room reflection at 4 ms. You should stay clear of it. The gating marker in the response window moves as you make changes in the impulse window. Here, I have set the gating a little below 300 hz. 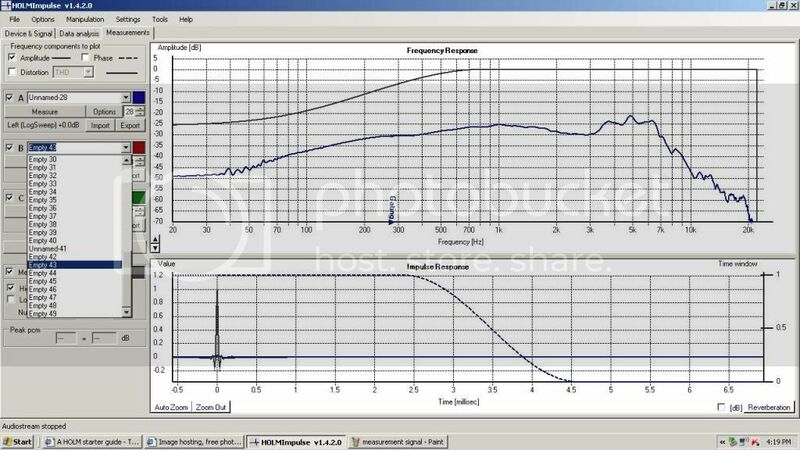 I find 300 hz suitable for x-over work, although if the setup allows setting it lower, that's even better. If you go too far, the reflections in the room will affect the response. If you want to look at an old measurement, click for the drop down. 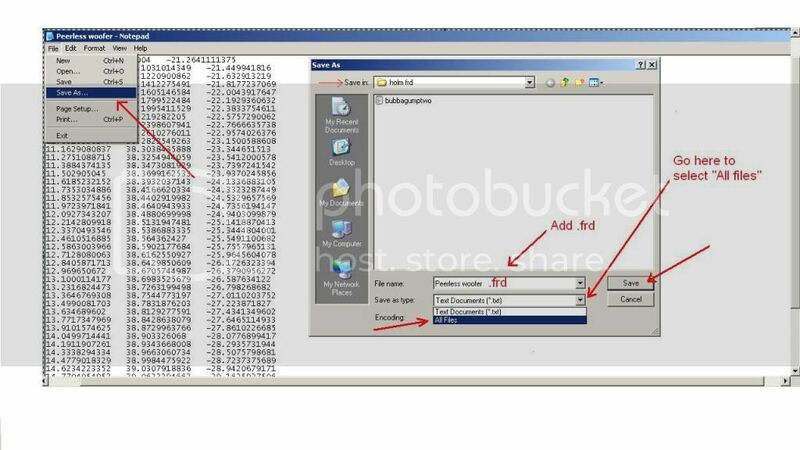 If you named the file so that you know what it is, then you can view it. My computer got hit by a virus I think. All my measurements are gone. Luckily, I saved many of the interesting ones on my desktop. If you have one that you want to keep, select an empty one, and the previous sweep will be saved in the list. You may want to turn off the measurement signal display in order to better see the impulse more clearly. 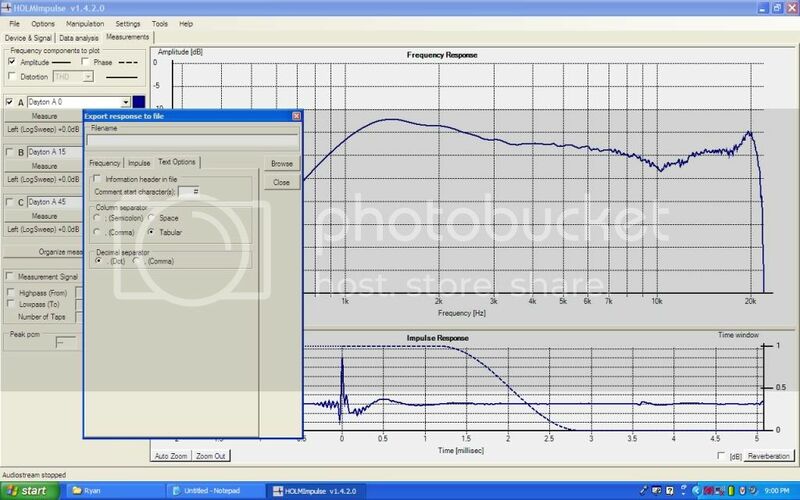 The signal display is the black lines in both the response window, and the impulse window.If you leave it showing, the impulse response is too small to see reflections. The check box is right above the highpass. If you are interested in the distortion of the driver, check the box at the top left of the HOLM window. Don't be alarmed at what looks like a high distortion level. There are lots of things that affect it. If you want to add a second measurement, such as a tweeter, or off axis, click on one of the other measurement buttons to run a sweep. Notice that I selected the highpass, (bottom left), and set it at 300 hz. This is marginal to no protection for the tweeter, and should be done at low SPL. A higher highpass setting may cause problems. Trying higher settings won't hurt anything, but the response may look way off. Many builders on the forum recommend using a cap to protect the tweeter. Use a cap, unless you are sure you don't need it. 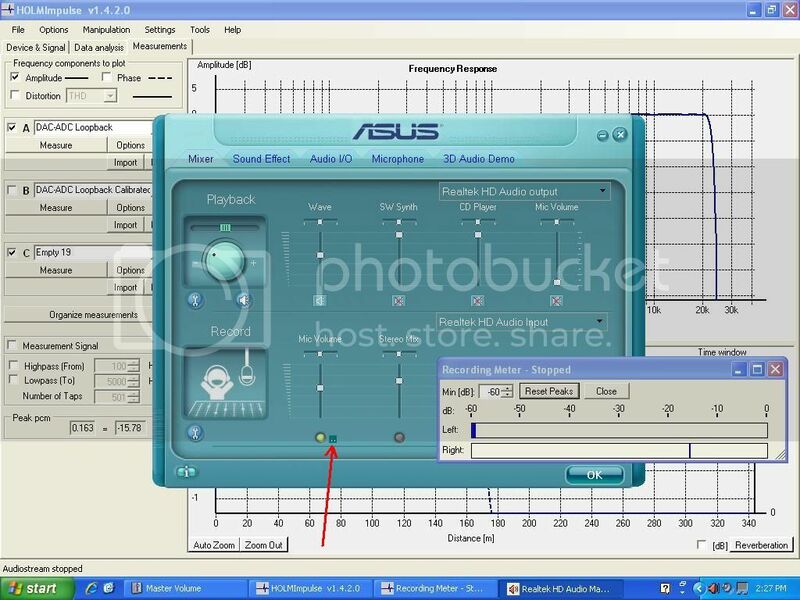 Turn off your amp before shutting down windows. Otherwise the Windows shutdown theme music may play full range through your tweeter if you are not using a cap. You can name the responses if you want, and you can display up to three responses. If you want to see a raw response, or one with some smoothing, click the option button to display the drop down menu. I selected 1/12 octave smoothing on this one. The check box for raw is a couple inches above the smoothing checkbox. The check box for gated is just below the one for raw. I also adjusted the offset to raise the position of the measurement on the display. This is a handy feature. 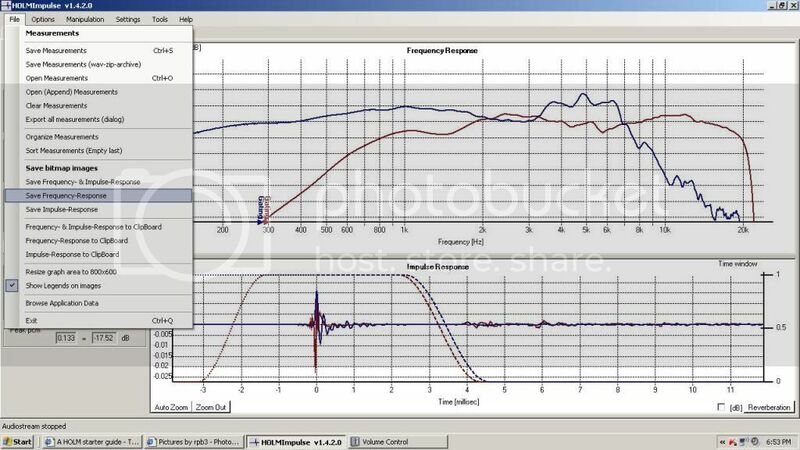 If you want to save a frequency measurement, click on file, and select "Save Frequency-Response", and give it a name. This is the saved response, which can be posted without including the rest of the HOLM page. Last edited by rpb; 02-14-2012, 06:23 PM. Last edited by rpb; 02-18-2012, 05:25 PM. 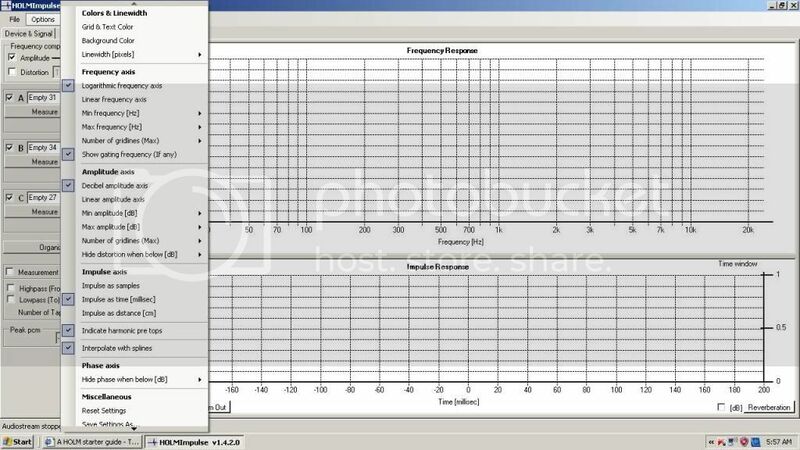 To create an .frd from a HolmImpulse measurement, the following steps should be taken. Note, this seems like a ton of work, but once you've done it once, it's a snap. Some excel knowledge is necessary. 1. 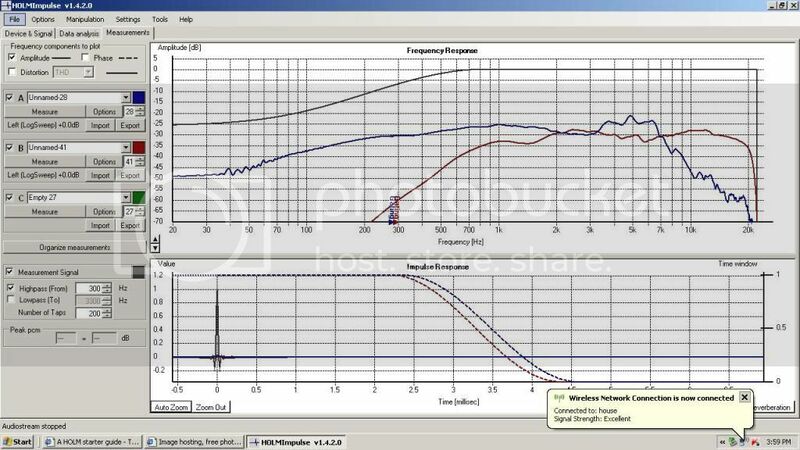 Adjust your measurement as it should be (gate, smoothing, etc.). 2. 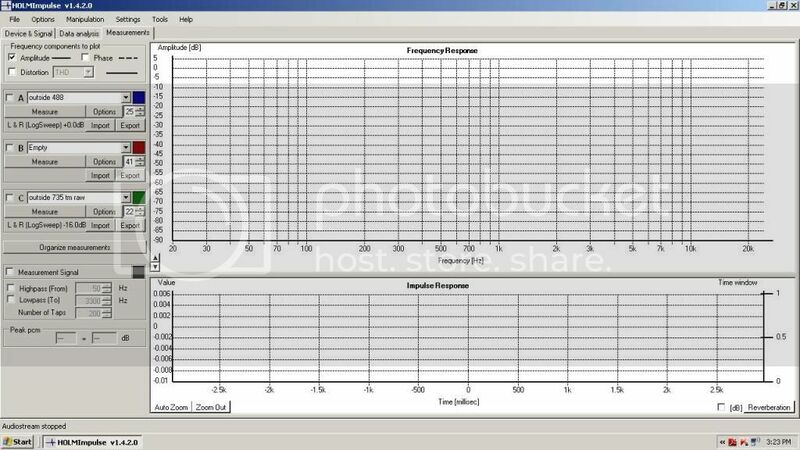 Click on Export next to the measurement box on the left (picture 1). 3. 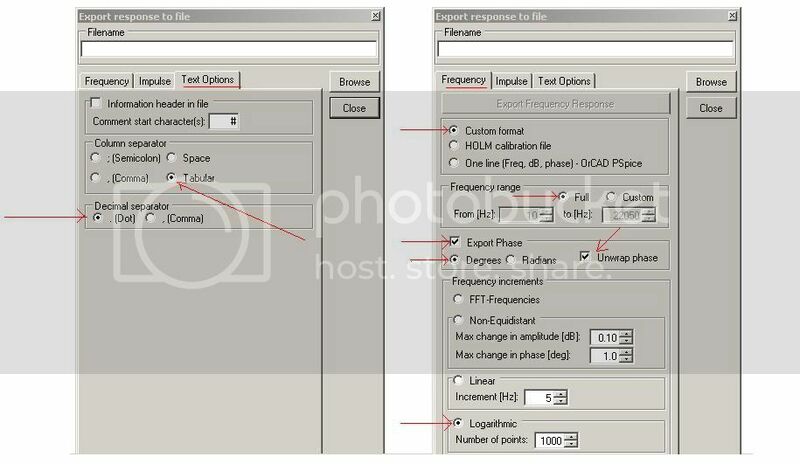 Adjust the settings under the frequency tab as shown in picture 2. 4. Adjust the settings under the text options tab as shown in picture 3. 5. Go back to the frequency tab and click "browse". 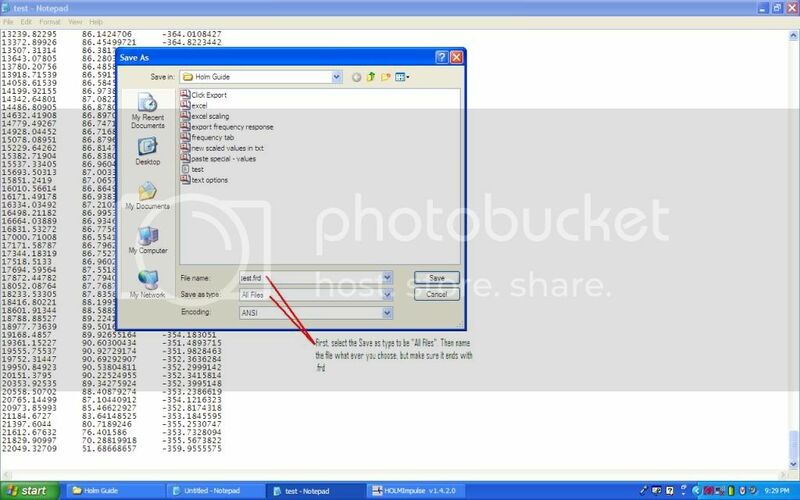 Choose a file destinations and give the outputted file a name (ie. RS28A on axis). 6. 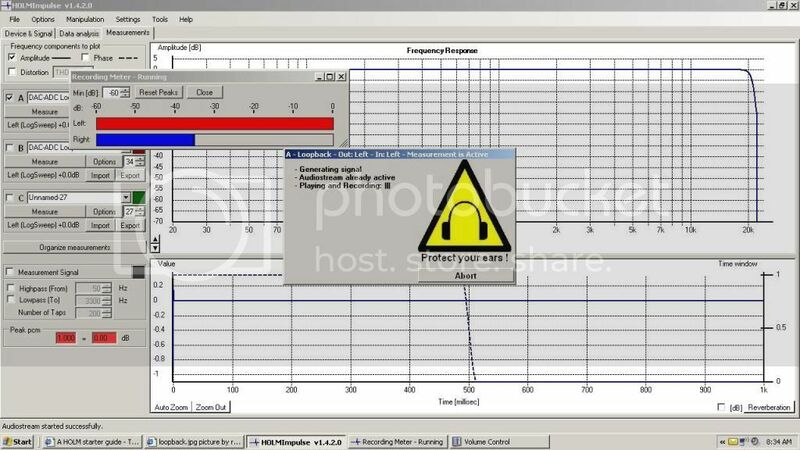 Click Export Frequency Response. 7. Go find the file where you saved it and open it. It's a .txt file. 8. Right click and select all. All the data will be highlighted. Now hit ctrl+c or right click/copy. 9. 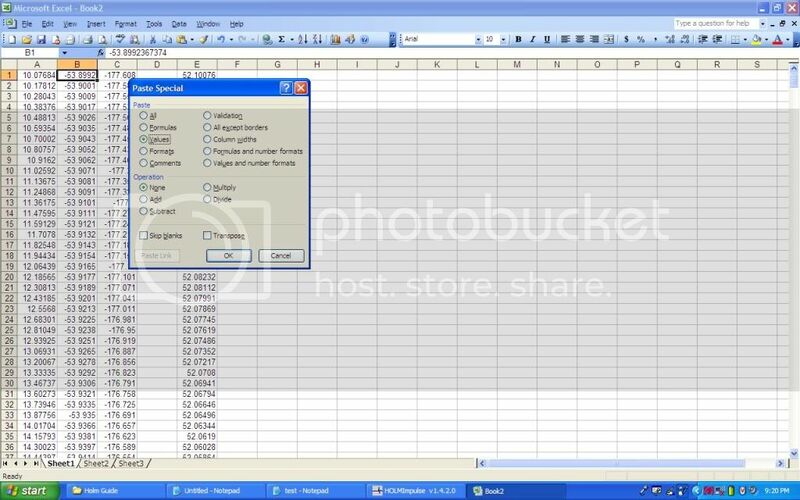 Now open up a blank excel document. Select the top left cell, and hit ctrl+v or right click/paste. 10. All the Holm output is now in excel. You need to scale the middle column to the desired SPL. 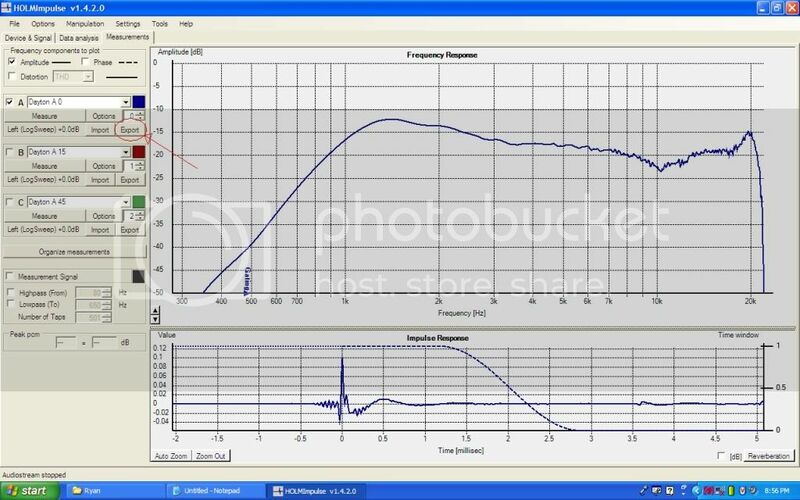 So if you have an 88db tweeter that measured -21db, you need add 88+21 = 109. If you measured two drivers from the same distance and volume, this scale value should be the same. 11. In an empty column to the righ, start a formula that says =B1+109 (or what ever scaler you determined in step 10). 12. 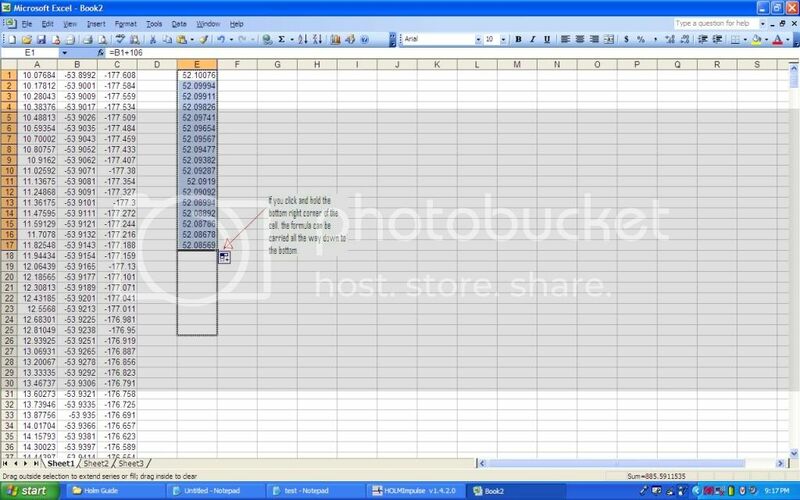 Apply that formula all the way to the end of the data set by grabbing the bottom right corner of the cell and pulling down. 13. Copy that columns data. 14. Click on cell B1 and right click. Select "Paste Special", "Paste Values". Windows 7 does this a little different than XP. 15. Now you data is scaled. 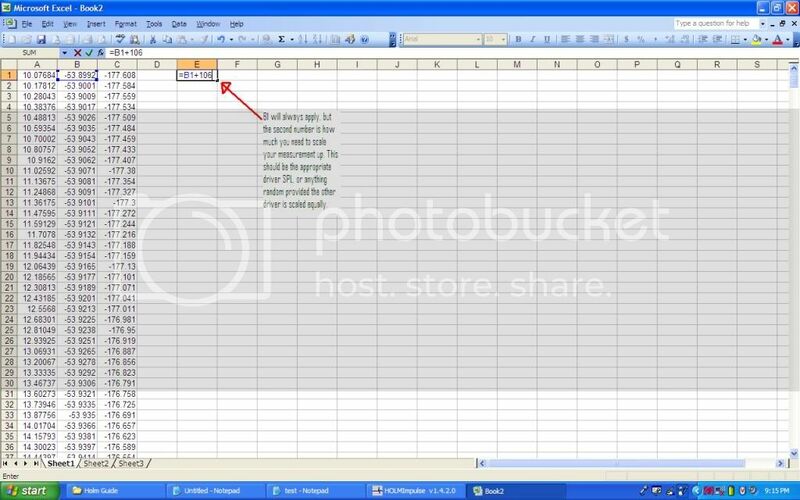 Copy all of the left 3 columns and past them into a text document. 16. Click file/save as. From the save as box, select "All Files" from the "Save file type" drop down box. 17. Name your file, but make sure you end the file name with .frd . A slight clarification, and screenshot from an XP machine. 18. You now have an frd file that can be imported into PCD. 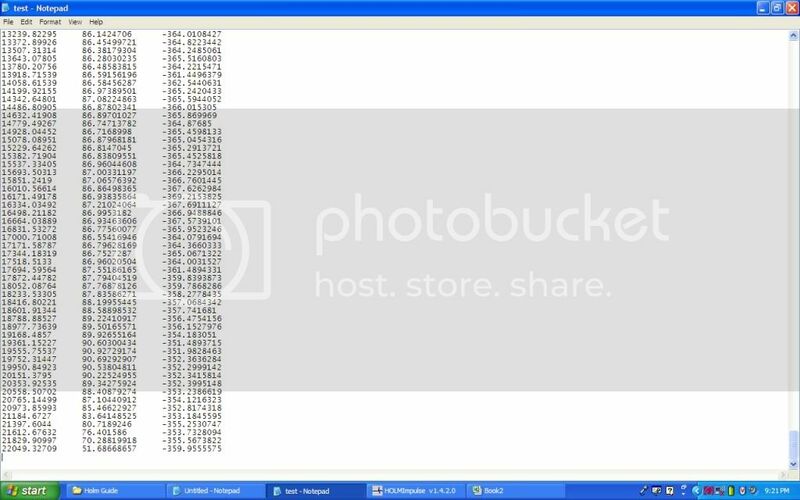 Likely want to manipulate that file, such as extract minimum phase. 1B. Click options next to the measurement box on the left. 1C. 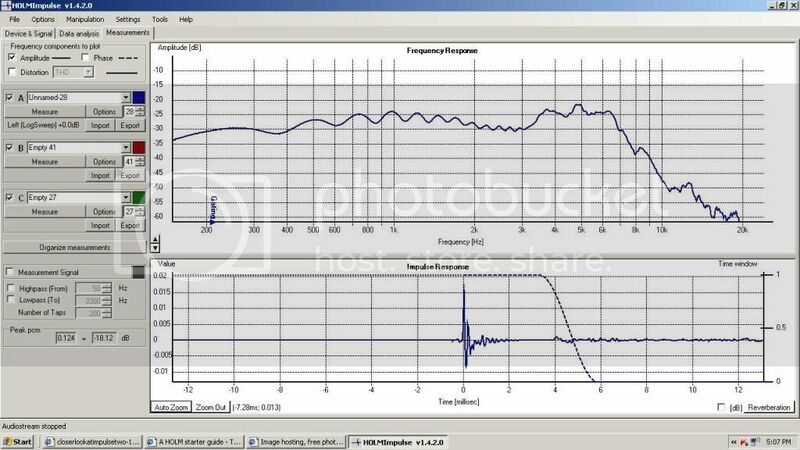 Select an offset of 99db or less. Last edited by rpb; 02-15-2012, 06:41 PM. Last edited by rpb; 02-10-2012, 07:07 AM. Last edited by rpb; 02-12-2012, 03:49 AM. The ideal setup would be to have the speaker 100 feet in the air, with nothing nearby to reflect sound. The mic could be about 10 feet from the speaker. Obviously, this isn't going to happen at my house. What I like to do, is set up outdoors once in a while. I place the speaker on a six foot ladder, and use a mic taped to a golf club shaft. I can set the gating lower with this setup than if I test indoors. However, 99% of the time, I measure indoors. To optimize my setup, I raise the speaker to get the driver 4' above the floor, and 4' from the ceiling. The nearest wall is also over 4' away. 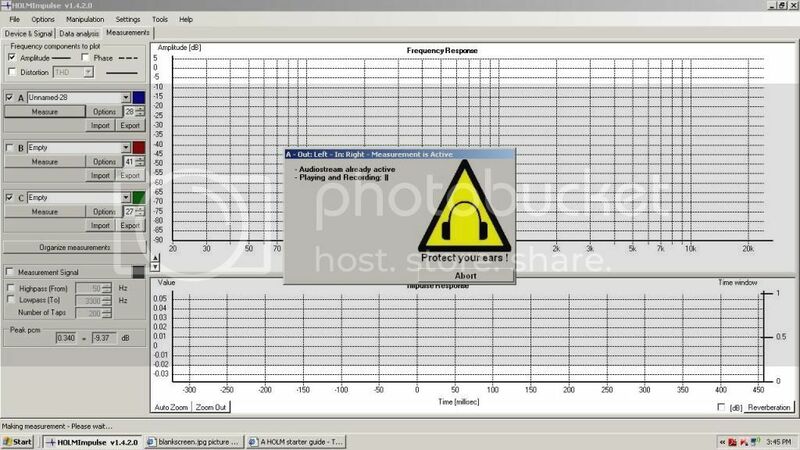 I can usually adjust gating down to 300 hz this way. How loud does the sweep need to be? 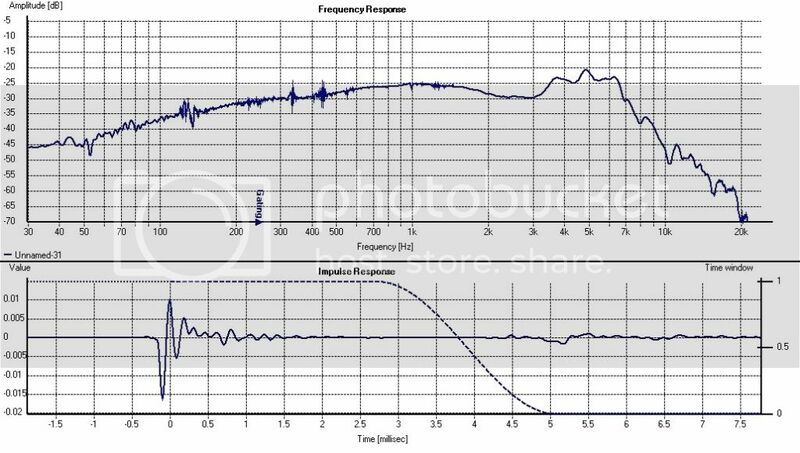 It works fine at low SPL, but you could accidentally start a high SPL sweep, so wear ear protection just in case. Here's three sweeps. The lowest is a level you might use if someone in the house is sleeping. The loudest of the three was not loud enough that I was concerned about ear protection. 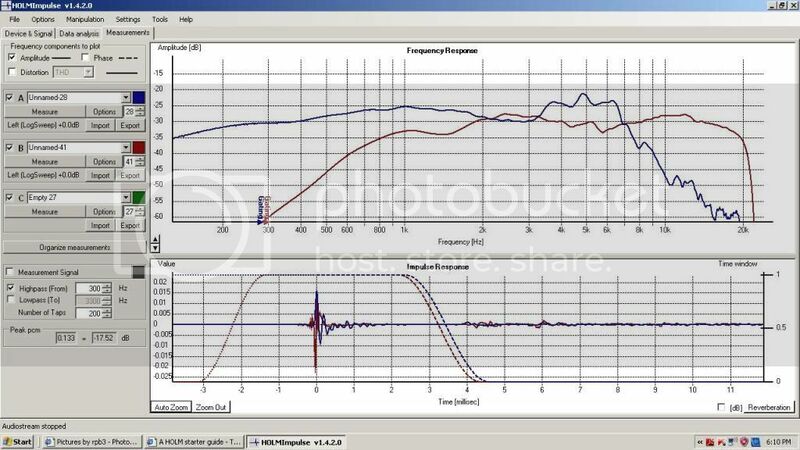 The basic response is the same, with the exception of the noise you see at lower frequencies. I turned on my furnace fan, and the gas part may have been running as well. In the next sweep, I talked in a normal voice during the sweep, just to get an idea how much problem it would cause. A louder sweep would have less of a problem than shown here. I have measured outside while neighbors were mowing, or running leaf blowers. The sweeps were loud enough that it was not a problem. Can you use any mic? The easier option is to buy something like this that is calibrated. I think the best way is to compare two drivers at the same SPL. In this set of measurements, I compared two of my midbasses. Third order distortion was very close, so I used second order to demonstrate here. The driver shown by the blue trace is is better overall. It's a larger driver, so it had an advantage. Last edited by rpb; 02-12-2012, 12:25 PM. Last edited by rpb; 02-09-2012, 10:50 PM.